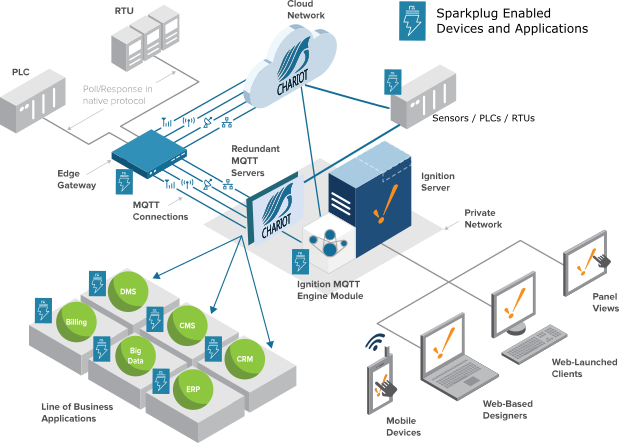 Cirrus Link provides an open source software specification (Sparkplug) to encourage clients to enable their applications, sensors, devices or gateways to seamlessly integrate data within MQTT Infrastructure. Sparkplug is currently being used with the Inductive Automation Ignition platform in conjunction with the Cirrus Link MQTT modules. The Sparkplug specification provides the necessary details for any MQTT enabled device to connect to MQTT servers and integrate (with zero configuration) into Ignition via the Cirrus Link MQTT Engine Module. Below are several tutorials on how to get started, that support various languages including C, python and Java. The examples show how data can be published via MQTT from an emulated device running on a development machine. In addition, it details how devices or projects can be controlled by writing to tags in Ignition. It also details the caveats associated with establishing/ending an MQTT session and ensuring that the tag values in Ignition are valid. The image below shows how with Sparkplug enabled devices and applications seamlessly connect to data to both IT and OT in real-time solutions with Ignition. To get Sparkplug specification with B format, please click here. For Sparkplug with A format, please click here. A github site is available for examples using Sparkplug reference code is found here. For the tutorials, support and latest documentation, please go here or go to the direct links to the implementations below.